Place cupcake liners into a muffin pan and set aside. Grease them if you’re using paper liners. Personally, I like to use silicon liners as they’re so easy to peel off when you’re ready to eat the cups. Place coconut oil, butter and maple syrup into a small saucepan and warm on the stove on medium-low to melt the oil and butter. Once oil and butter have melted take the pan off the heat and add in cacao powder, salt, and maca if you’re using it. Whisk to combine (make sure there are no lumps). Pour mixture into the cupcake liners to fill about 1/3 of the way or a bit less (you want enough leftover to fill the cups later). Place in freezer for about 15 minutes. 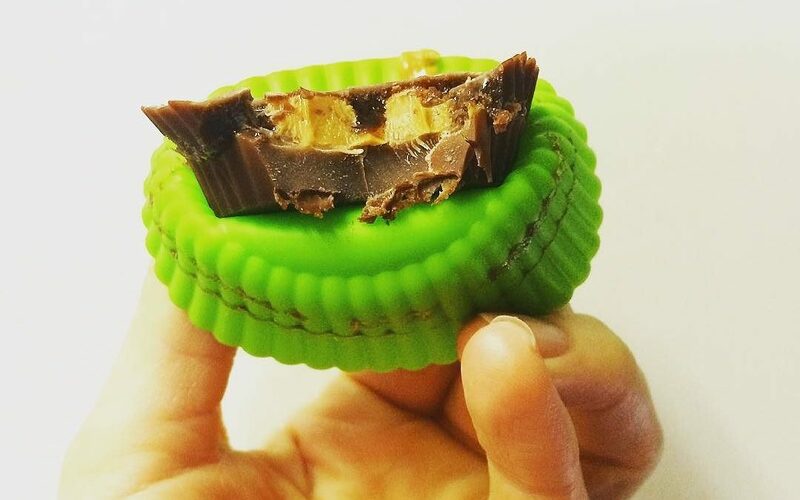 Take cups out of the freezer and add about a teaspoon or so of nut butter of choice into the middle of each cup then cover with the remaining chocolate mixture until you can no longer see the nut butter poking through. Place back into the freezer and freeze until solid. About 30 minutes. The salt I like to use is pink Himalayan salt. Choose your maca wisely. Make sure it’s gelatinized, as this breaks down the goitrogens, which can inhibit thyroid function. Also, make sure you like the taste of it. I enjoy this maca, which is a blend of yellow, red and black. I find it has a nice caramel flavour that really lends itself to this recipe.